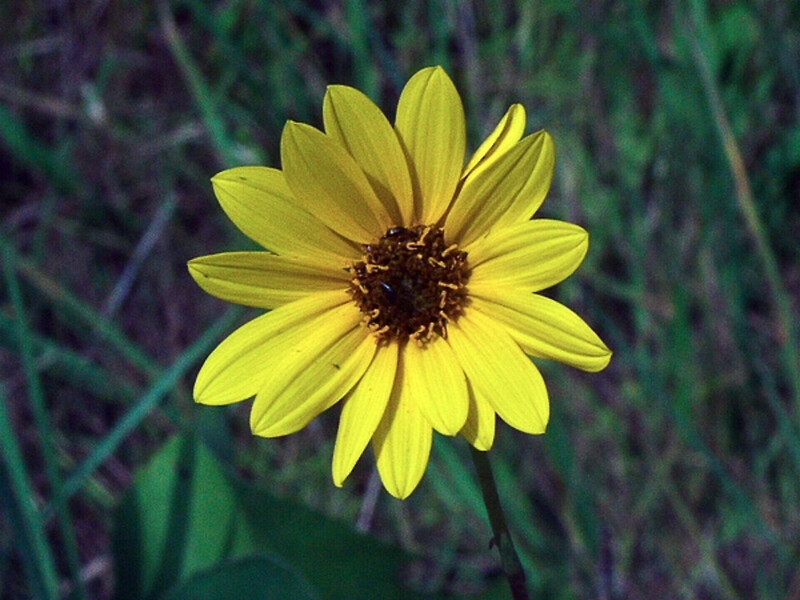 Stiff sunflower is a complicated, variable species with two subspecies as well as a rare stable hybrid (frequently cultivated), all of which are found in most New England states. This may pose more than the usual challenges to identification. 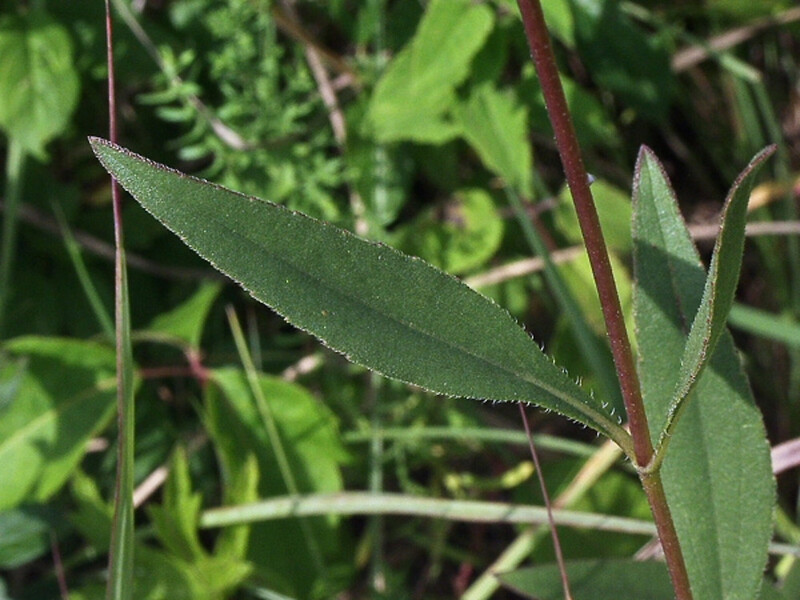 reproductive stems with mostly 3–5 nodes bearing highly reduced leaves or rarely the lower 2–4 nodes with well-formed blades, often the upper 50% of the stem lacking leaves, and plants with a basal rosette of leaves (vs. H. pauciflorus, with reproductive stems with mostly 6–15 or more leaf-bearing nodes, the blades gradually, if at all, decreasing in size upward, only the upper 25% or less of the stem lacking leaves, and plants often without a basal rosette of leaves). Helianthus laetiflorus Pers. var. rigidus (Cass.) Fern. Subspecies pauciflorus is known from CT, MA, ME, NH, RI. Subspecies subrhomboideus is known from CT, MA, ME, NH. 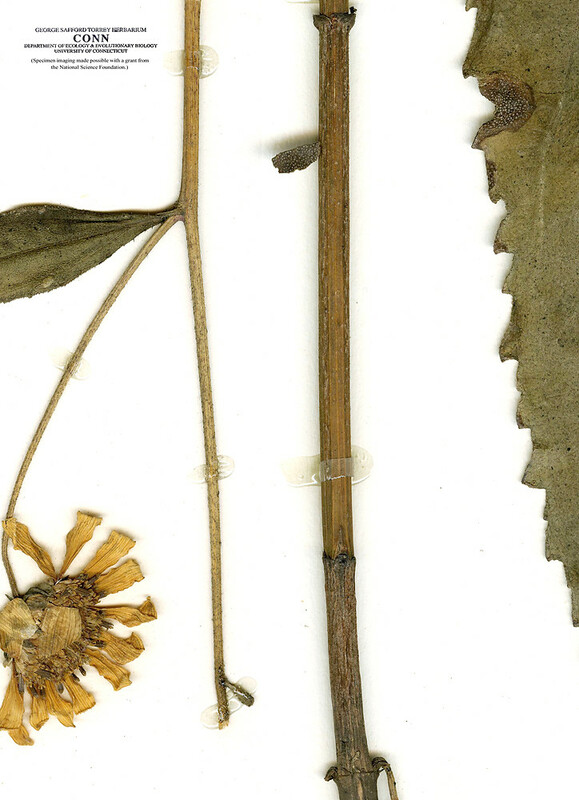 Clevenger and Heiser (1963) gave detailed accounts of crossing studies that suggested Helianthus ×‌laetiflorus is best treated as a hybrid (see below) and that ssp. pauciflorus may have arisose through through hybridization between H. pauciflorus ssp. subrhomboideus and H. tuberosus with later character segregation such that the stabilized entity closely resembles the former parent. Introgression with the latter species would explain the taller stems, longer leaves that are often alternate above, and longer petioles. stiff sunflower. 12a. 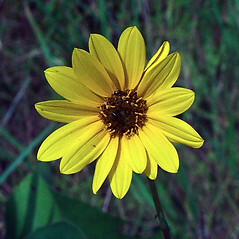 Helianthus laetiflorus Pers. var. rigidus (Cass.) Fern. ; H. rigidus (Cass.) Desf. ; 12b. Helianthus laetiflorus Pers. var. subrhomboideus (Rydb.) Fern. ; H. pauciflorus Nutt. var. subrhomboideus (Rydb.) Cronq. ; H. rigidus (Cass.) Desf. ssp. subrhomboideus (Rydb.) Heiser; H. rigidus (Cass.) Desf. var. subrhomboideus (Rydb.) Cronq. 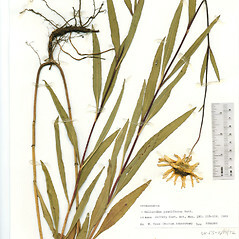 ; H. subrhomboideus Rydb. 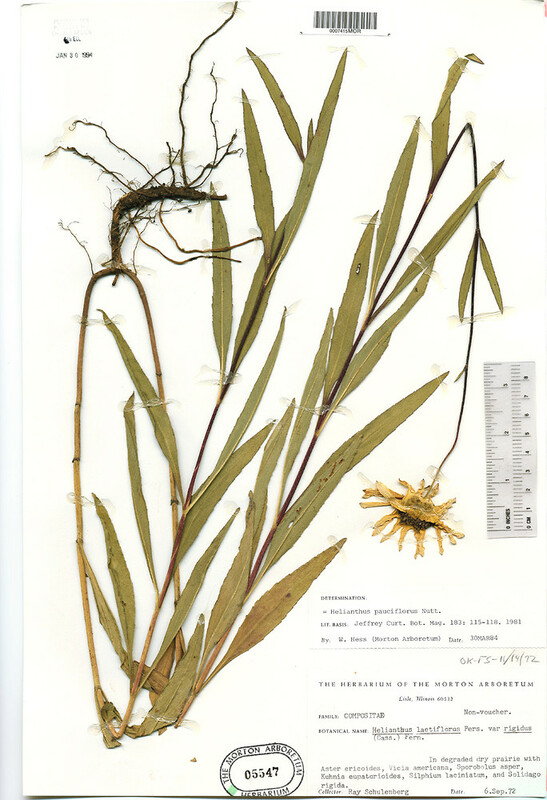 • CT, MA, ME, NH, RI; also reported from VT by Kartesz (1999), but specimens are unknown. Roadsides, fields, disturbed soil. 12×15. Helianthus pauciflorus × Helianthus tuberosus → Helianthus ×‌laetiflorus Pers. 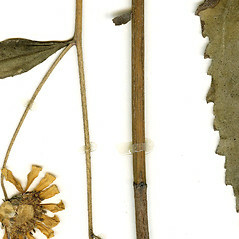 is a rare hybrid sunflower that frequently occurs in the absence of its parents. It is known from CT, MA, ME, NH, RI, VT. 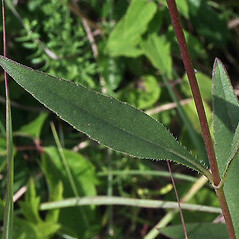 It is similar to H. pauciflorus in regard to involucre characteristics and often disk corolla color (though the corollas can also be yellow), but the involucral bracts are oblong-lanceolate with an acuminate apex, are sometimes sparsely short-pubescent abaxially, and 7–12 mm long (vs. elliptic to oblong-ovate, acute to obtuse, ± glabrous abaxially, and 6–10 mm long; lanceolate with an acuminae apex, hispid abaxially, and 8.5–15 mm long in H. tuberosus). It also occasionally shows the branching tubers of H. tuberosus.